Easter Island is a Polynesian island in the southeastern Pacific Ocean, at the southeastern most point of the Polynesian triangle. 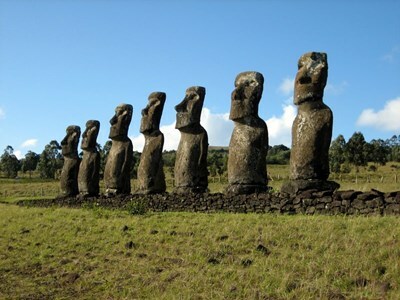 A special territory of Chile annexed in 1888, Easter Island is widely famous for its 887 extant monumental statues, called moai, created by the early Rapanui people. It is a World Heritage Site (as determined by UNESCO) with much of the island protected within the Rapa Nui National Park. This description uses material from the Wikipedia article on Easter Island and is licensed under the Creative Commons Attribution-ShareAlike License (view authors). 151 people want to do this. 2 people have done this.